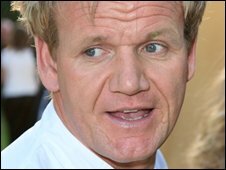 TV watchdog Ofcom has ruled that an episode of Channel 4 show The F Word featuring chef Gordon Ramsay eating a puffin did not break the rules. Ofcom received 42 complaints over the show which saw Ramsay "sky fishing" for puffins and eating its fresh heart. The regulator said the sequence was not in breach as it occurred in Iceland, where the puffin forms a popular part of the national diet. It also noted the birds were killed in a humane way with minimal suffering. Viewers had complained that the practice of killing puffins was cruel, the local tradition of eating their fresh hearts was offensive, and that, whilst not protected, puffins were a species under threat. However, Ofcom said that The F Word had historically contained items featuring the rearing, hunting or killing of a variety of animals for food, including those not usually eaten in the UK. It ruled that viewers should therefore have been prepared to some extent for an item similar to the one complained of. Ofcom also noted that the programme began at 2100, and that a verbal warning about the killing and gutting of birds was broadcast at around 2145, immediately before the section showing these images. The regulator said it appreciated the concern of viewers who were unhappy that puffins should be caught and eaten in this way. But it added it did not consider the item went beyond the audience's general expectations for the programme, which had consistently challenged conventions in the UK about the acceptability of various foods and ingredients from around the world. In the same report, Ofcom also noted 31 complaints from viewers over a BBC News report about an incident in Jerusalem. Footage showed a Palestinian man ramming buses and cars with a bulldozer, killing three people and then the man being shot dead in the cab of the vehicle by an off-duty Israeli soldier. However, as the BBC later publicly acknowledged that broadcasting the footage of the moment of death was not justified editorially, Ofcom said it considered the matter resolved.